We invite you to #BeDowntown this St. Patrick's Day to experience great places and spaces to wear green and get festive. 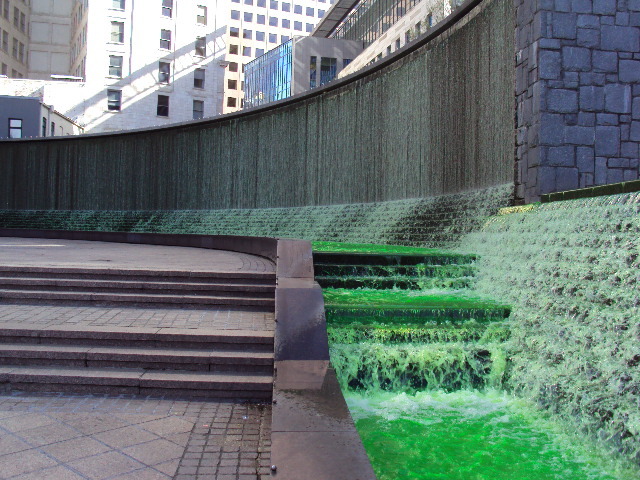 The Atlanta Downtown Improvement District plans to dye the fountains green again this year, making the park extra emerald. Stop by the Reading Room to enjoy the fountains during your lunch break, and take a #StPatsSelfie in front of the green water wall on the north end of the park. This Friday, March 17, wear your best green and head to Peachtree Center for a performance so spectacular you just might pinch yourself. The Drake School of Irish Dance will be performing for employees and visitors at the food court at noon in the spirit of everyone’s favorite Irish holiday. So, take a break from your day job and come enjoy the sounds of Irish dance while grabbing a bite from favorite Peachtree Center lunch spots like Gibney’s Pub and Panbury’s Pie Café. It's your lucky day, Georgia Aquarium is celebrating St. Patrick's Day! Join the St. Patrick's themed fun while enjoying music, signature cocktails and delicious small plates. Sips Under the Sea is a unique cocktail party for adults to enjoy Georgia Aquarium after hours with family, friends or a significant other. You'll have the entire Aquarium to yourself while enjoying cocktails, tapas and entertainment… all without kids! For dinner, head to Terrace Bistro at the Ellis Hotel, where the St. Patrick's Day dinner menu includes festive fare like corned beef and cabbage and a Reuben served on H&F rye bread. Afterward, ppop into a pub to raise a glass and cheer Slainte. Meehan's Public House will be hosting a lively St. Pat's celebration, complete with drink specials, giveaways, and plenty of Guinness. For a bar that exclusively serves Georgia-brewed beers, try the new Georgia Beer Garden on Edgewood Avenue. Did you miss the official event on March 11? No worries: you can still ride the Streetcar for a self-guided pub crawl. Use the interactive route map to identify hot spots near each of the twelve stops. This month, we're highlighting the Carnegie at Spring stop, which is a short walk from Meehan's, Juke Joint, Braves Grill and Ted's Montana Grill. There are plenty of family-friendly ways to celebrate the holiday, too. The Children's Museum of Atlanta will host celebratory activities on Friday from 1:00 - 3:30 p.m. Through March 31, the College Football Hall of Fame will offer $17.99 admission to those who wear green college gear, and the World of Coca-Cola's "Friends and Family Four-Pack" promotion includes four general admission tickets for $40 ($28 savings).